Ever tried to read a book of economics but found it to be full of jargons, full of equations and terms not so familiar to a layman? if not, then read a book like The General Theory of Employment, Interest and Money by John Maynard Keynes. You will find how difficult it can be to read economics books for someone who does not have an economics background. Ever thought that sociological or criminological incidents can be explained using principles of economics? Ever thought that economics can be blended with Pop-culture? Well, Freakonomics is the answer. 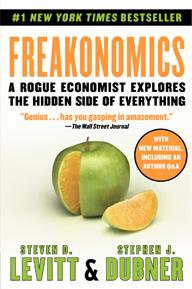 Written by Steven Levitt, a professor of economics at the University of Chicago, in collaboration with Stephen J. Dubner, a journalist, Freakonomics: A Rogue Economist Explores the Hidden Side of Everything is an interesting read. What makes this book stand apart from other books on the similar topics is the interesting approach to data and statistics. Levitt uses data and data analyzing tools to reach conclusions which would not have been possible by simply analyzing social behavior and sometimes the results are contrary to what is considered norm and accepted in society. His work is mostly in the area of crime, social behavior and economics of incentives. These incentives can be financial, social or moral. The topics which Levitt and Dubner discussed in Freakonomics are not considered strictly topics of economics but they fall more into the area of sociology. To illustrate the theme of the book, let us consider one of the examples. In this book, authors discussed how instances of cheating by the teachers of Illinois public school system increased. This happened because the incentives were increased for the teachers if their students performed well in respective subjects. After analysis of years of data, authors reached to the conclusion that cheating peaked in 1996 and it made sense also because teachers were paid more for the inflamed but empty performance of the students. In the same category, he also puts the sumo fighters of Japan who lost the matches intentionally so that most of the fighters stand as gainers. This created a controversy and investigations were ordered into sumo fighting championships. Another example which created controversy was the correlation between abortion and crime. Authors argued that Legalization of abortion in 1973 led to the reduction of crime in 1992 because youths between 18 to 24 are most vulnerable to crime. The arguments they put forward was that those parents who did not take care well of their children had their children more likely to become criminals keeping in mind other factors like less average income which plays its role in proper bringing up of the children. This resulted in a series of rebuttals and rebuttals of rebuttals by the big names in the area of economics. Read this book for an insight on social problems and what data says about them. Other problems mentioned in the book such as Ku Klux Klan (KKK) and working of real estate brokerage industry also show convincing arguments by the authors. What is true about most of the topics is that we can give counter arguments and so the debate will go on. Encouraged by the success of this book, authors have released a film in 2010 and the second part of the book named SuperFreakonomics was also released. Do not expect to gain an understanding of any path-breaking economic theory, this is just a book intended for masses.